India is all set to acquire a second nuclear submarine on lease from Russia. The two sides have had preliminary discussions and a serious push is expected when Indian Defence Secretary RK Mathur meets his Russian counterparts during his visit to Moscow next week. The idea had germinated in the Indian strategic establishment long before the Russian-built electric-powered submarine INS Sindhurakshak got sunk at its moorings in Mumbai naval dockyard on August 14. Now with the Sindhurakshak practically gone forever and the Indian submarine fleet having been constricted to just 13 – of which only 7 or 8 can be operational at a given time – the Indian idea has acquired a greater steam. The loss of INS Sindhurakshak seems to have catalysed the Indian defence establishment to come up with ideas that would ensure that India’s undersea warfare capabilities are actually bolstered, and not dented. Indian Defence Secretary RK Mathur is all set to lead an Indian tri-service delegation to Moscow for the next round of High Level Monitoring Group on Defence. Mathur will be reaching Russia on September 1 for these crucial talks and the issue of taking on lease a second Russian nuclear submarine for the Indian defence forces will be very high on his agenda. Sources say the Indian defence secretary will be negotiating with his Russian counterparts on many other agendas but his foremost talking point would inevitably veer around the subject of India acquiring the nuclear submarine on lease as it would provide New Delhi an immediate solution to deal with maritime threats in the neighbourhood. The Russians are positively inclined to the idea of leasing a second nuclear submarine to India, according to sources. Actually, if this idea were to translate into reality, it would be the third nuclear submarine that the Russia would be leasing to India. The first time it was then Soviet Union which had leased a nuclear submarine (named INS Chakra by the Indian Navy) way back in 1988. The lease at that time was only for three years and the Indians duly returned the vessel after the lease expired. The second time India got on lease a nuclear submarine from Russia was a couple of years ago when India and Russia finalised the contract for it in 2011 and the Russian Nerpa class submarine was inducted into the Indian Navy last year as INS Chakra. The lease cost a billion dollars to India for a period of ten years. The third lease, if it transpires (which it should given the political will from both the sides), should also be for a minimum of ten years. However, the lease values may be a bone of contention for the two sides. 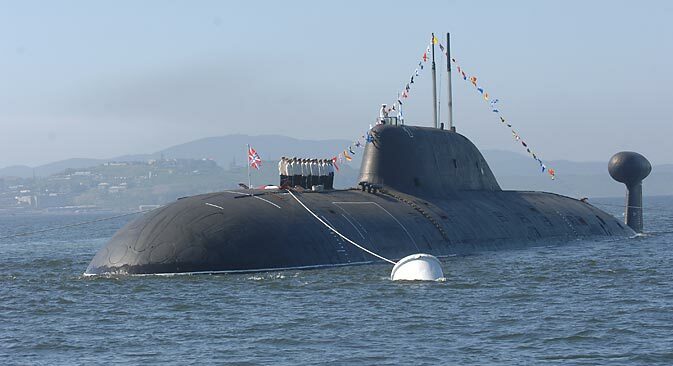 While the Indians are willing to shell out a billion dollars for taking on lease another nuclear submarine for a period of ten years, the Russians have jacked up the monetary value. Moreover, the Russians have already conveyed to their Indian interlocutors that India cannot hope to get a nuclear submarine on lease from any other country. From India’s point of view, though the Russian logic seems to be well in place but then other countries like France and the UK may be persuaded to lease a nuclear submarine given India’s standing in the comity of nations currently. The Indian strategic establishment seems quite upbeat on the idea of acquiring another nuclear submarine. The Indians have even named their probably acquisition as INS Chakra III.